Are you concerned about the state of your kitchen and/or bath, with all those relatives coming for the holidays? Well, we all know (or strongly suspect) that at this late date there is not time to do any major remodeling, but is there anything that can be done to spruce things up? Perhaps some cosmetic work that will cover up the problems for the visitors? Yes, we can do that! Small jobs can be fitted into our schedule to help you put on a great display for the holidays. Later, if you desire, more in-depth work can be done to make that kitchen more efficient and pleasant to work in. In the short term, grab bars can be added to steady infirm relatives and in-laws in the guest bath; faucets can be replaced and new mirrors and bath accessories can be installed to spruce up that room. Fresh paint in a guest bedroom can do wonders, as can replacing damage and worn-out trim. A new light fixture for the front porch can greatly improve appearances, as well as adding to safety if the old lighting fixture is not working as it should. Is Competitive Bidding the Best Way to Hire a Kitchen or Bath Remodeling Contractor? Bellingham complete kitchen remodel by Rose Construction Inc.
You won’t have complete plans for each contractor to look at in order to get an “apples to apples” bid. So the honorable contractor will include all the elements (like molding, light sockets and so on) that are not on the plans, but should be. An inexperienced (or shady) contractor will not include those things, and therefore will give you a lower bid. When it is too late to change contractors, you will have to pay for those extras. Some people get bids in order to see how much the project their architect designed will cost. That takes an enormous amount of a contractor’s time for a job he may not get. Many contractors will no longer do competitive bidding. Since competitive bidding is still viewed by some as the only way to control construction costs, lowest price may be over emphasized at the expense of quality, value and service. A contractor who does engage in the competitive bidding process incurs the expense of estimating as well; and, because that contractor usually has to bid a number of jobs in order to secure one construction contract, he/she has to work that expense into his/her pricing on contracted projects to recover costs. What are the alternatives to competitive bidding? Find an excellent contractor (whom you judge by face-to-face meeting, talking to staff, talking to references, visiting prior jobs, searching to internet, considering awards and professional certifications), and an excellent architect or designer (judged by the same criteria), and put these two stellar individuals together to design and build your remodel. Or hire a design-build firm where the designer and builders are in the same firm. This way, when the designer comes up with an idea that would blow your budget, the contractor will make that known immediately. Or, if your project doesn’t need a designer or architect, go with a reputable contractor that you have done your homework on. 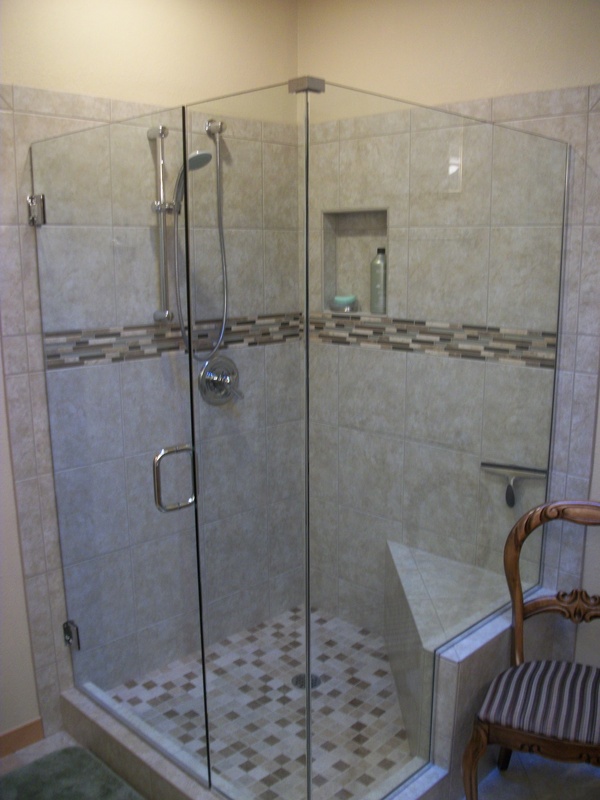 Bath remodel by Rose Construction Inc. 4 by 4 built-in tiled shower with 1/4 inch clear tempered glass enclosure. In our kitchen and bath remodels, we have found that when clients come to us for remodeling, they are often looking for just the amenities listed below – either to add them, or to update what they have. Sometimes adding onto the house is required to make room for the desired options, or even moving walls! But, oftentimes, a kitchen or bathroom can be re-arranged to fit in the changes; every house is unique. 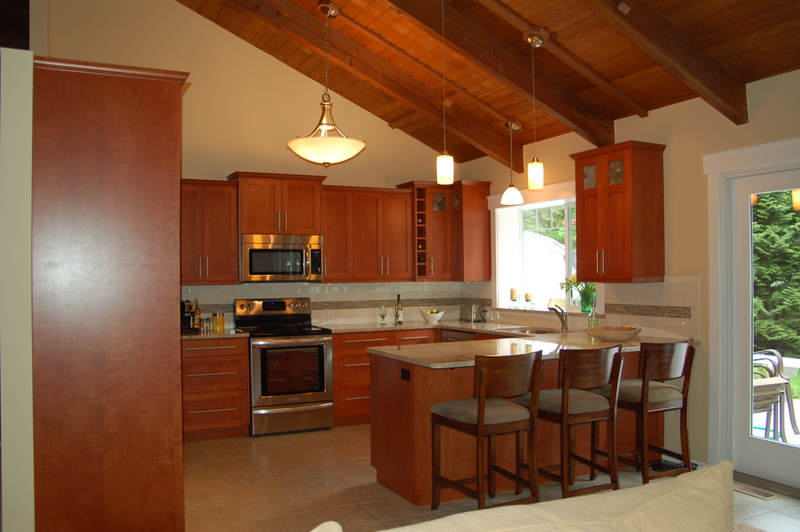 Kitchen spaces – A kitchen island and walk-in pantry are on the top desired amenities of a list of 13 kitchen spaces. Key bathroom spaces – Dual vanities/lavatories in the master bath and a tub/shower combo in the secondary bathroom filled the top two desired amenities out of field of 12 possible options for bath remodels. Key living spaces – Whoa! This category listed 25 possible options, and the to 3 were found to be a walk in closet in the master bedroom, a great room (kitchen/living/dining), and high ceilings (9 feet or higher on the first floor). Key outdoor spaces – Here again, survey takers were given a generous list of 20 options, with the to contenders found to be an oversized garage with room for storage, a two car garage, and a three car garage. Hmmm . . . not sure how that works out. So, summarizing, dual vanities/lavatories in the master bathroom were ranked by builders as the most important bathroom amenity to their buyers. A kitchen island was ranked by respondents as the most highly desired kitchen amenity among buyers, followed closely by a walk in pantry, and breakfast nook. By far, respondents ranked walk-in closets as the top living area amenity among their buyers, followed by a great room, high ceilings and energy-efficient features. 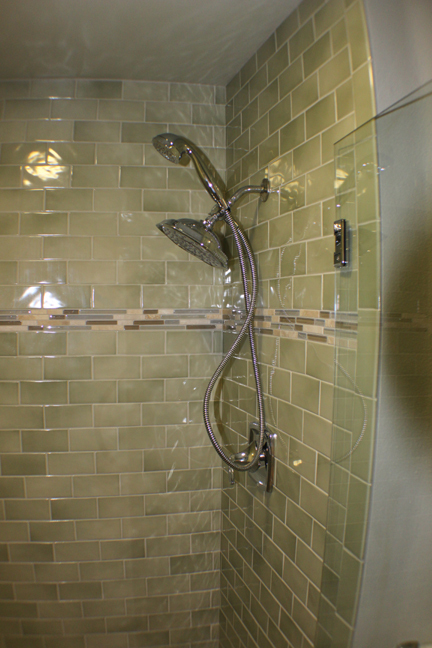 MGS manufactures a stainless steel shower fixture as well as s.s. fixtures for the outdoors and kitchen. Each faucet and shower fixture includes MGS’s signature handles with flat, angled tips, sliced from across the cylinder to create a dramatically slanted face. The exposed shower system shown brings modern style in an exposed shower system with a round or square rain canopy and feature an exposed thermostatic mixer. Check out www.mgsdesigns.com for more creative and stylish designs! The National Kitchen and Bath Association provides a wealth of information for those thinking about remodeling their bathrooms or kitchens. 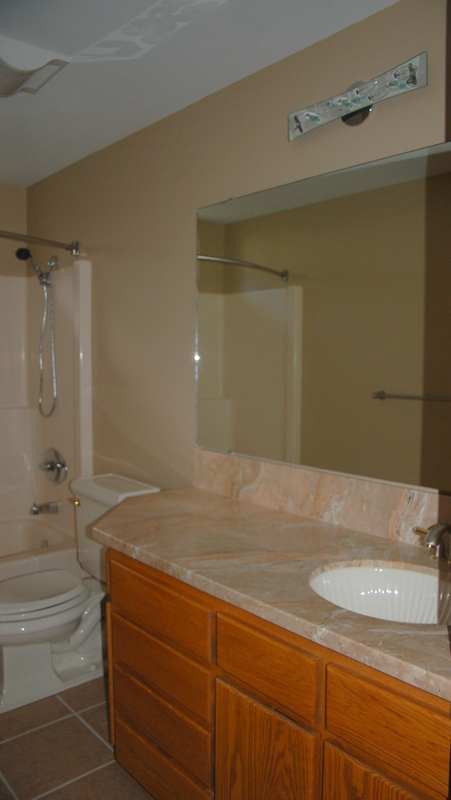 This article focuses on material selection for the bathroom vanity top. Granite and marble are very beautiful and at $125 to $250 per lineal foot, the most expensive. For some, this will be a non-starter for this countertop material. However, if the price is not an issue for you, granite is an excellent choice; it doesn’t stain. Granite or marble tiles are a less expensive solution than purchasing and entire sheet to be cut to size. Cultured marble is another less expensive option, and is made from chips of real marble embedded in plastic. It costs $50 to $80 per lineal foot. One drawback is that scratches cannot be removed. Laminate is a popular option, due to the endless variety of colors and an inexpensive price tag. The can be bought in pre-fabricated vanity tops. 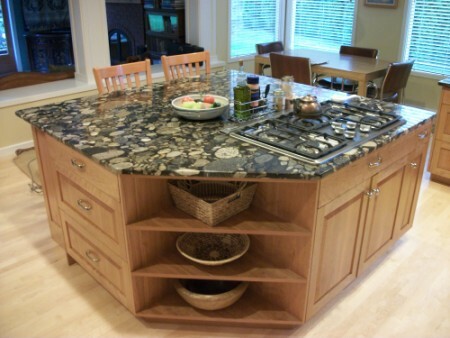 Solid surface countertops have the look of stone, but have fewer drawbacks. Made with acrylic resin, they require very little maintenance and scratches and even minor burns can be repaired with sandpaper. They are available in many colors and imitation stone, and can be purchased as ready-made vanity tops with integrated sinks. Pricing is from approximately $100 to $250 per lineal foot installed. Tile is an attractive durable finish for countertops. Of course it is available in many colors, patterns and textures. Grout that must be cleaned can be a drawback. Tile installations cost between $10 to $40 per lineal foot. Wood is also used as a vanity countertop, but is especially vulnerable to water damage. It must be well sealed to keep it clean and prevent rot. It runs $25 to $40 per lineal foot. Be sure to check out the NKBA website for many more articles on plumbing fixture selection, cabinets, faucets and budgeting your remodel, as well. How important is paint in your remodel project? Very important! For many reasons, not least of which is the large area of ceiling and walls that will be painted. You will want colors that coordinate well with furnishings and with each other if you choose more than one color for a room. Additional issues with paint may involve whether you prefer non-VOC (Volatile Organic Compounds) paint, as many people have health issues from the off-gassing of traditional paints. In areas subject to dampness such as bathrooms, a paint rated specially for kitchens and bathrooms would be best, in an easy to clean satin or semi-gloss finish. Sherwin-Williams has a neat site where you can upload a photo of a room you will be remodeling and painting and it will automatically color the walls (even half-walls) with colors you select, so you can see what it will look like before purchasing any paint! Behr has an equivalent on-line program where you can upload your photo and try out different colors effortlessly! It is great to be able to hire someone to actually do the work. Taping around the trim, covering the flooring and furniture can be more than we want to do. The photos are from Room Color Idea. I find that just looking at paint swatches, no matter how well presented, are hard to visualize on an entire room. In addition, seeing what others have done give me ideas that I might not have come up with on my own. So check out the room colors that others have used and try them online on a photo of your room, then get going and select some paints to liven up (or maybe tone down) that room.